So this is a new segment that I plan to update weekly: International Beer of the Week. 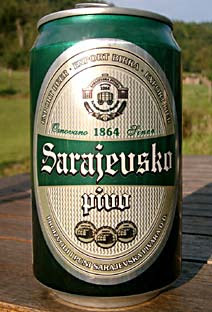 Sarajevska pivara, the brewery that produces Sarajevsko Pivo, has been in operation for over 150 years in the capital city of Sarajevo and along with the rest of the city Sarajevsko Pivara has seen its share of tough times. During the Serbian siege of Sarajevo, taking place from 1992 through 1996, nearly 10,000 people were killed in what would be the longest siege of a capital city in the history of modern warfare. Throughout this devastating period of Sarajevo’s history Sarajevska pivara’s doors remained open, beer production continued and the natural springs which flows out of the Sarajevska brewery became the only source of drinkable water in the entire city. With such an remarkable history one hopes that beer produced by such a brewery would be equally as intriguing. This particular Pale lager is light yellow in colour with a big bubbled, to fluffy transparent-white head. The flavor isn’t anything to be remembered dry, bitter ans a slight corn flavor with a long and bitter finish. The corn flavor comes as no surprise as this beer does contain some corn. Overall not a great beer, but that being said it is the perfect beer to sip while sitting in the astonishing Turkish quarter of Sarajevo. And what the hell, that brewery’s got character, so pick a litre from the closest grocery, or head to a quaint old town cafe and enjoy!